Mr.Zalophus@gmail.com Please click on the sea lion head logo above to go to my MarineBioPhotography website. 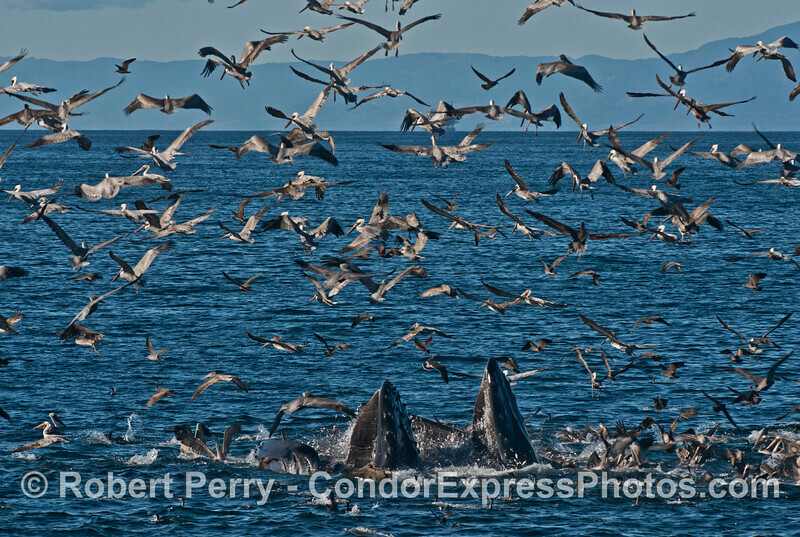 I've been shooting photos on the Condor Express for 8 years and I have never, ever seen so much humpback whale gluttony on one trip as we saw today. 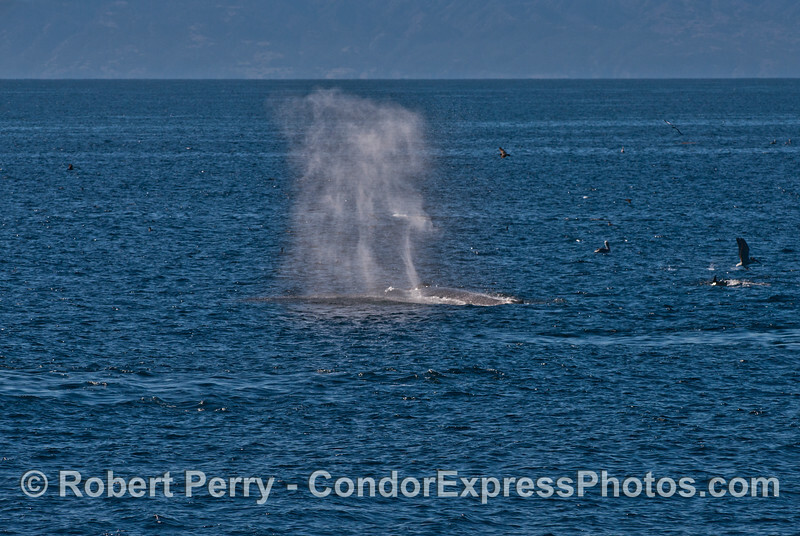 We had over a dozen humpback whales in the southeastern Santa Barbara Channel. Most of them came together on a hot spot and continued to lunge feed. on the surface and below, for over an hour. Sea birds were thick and actively diving. 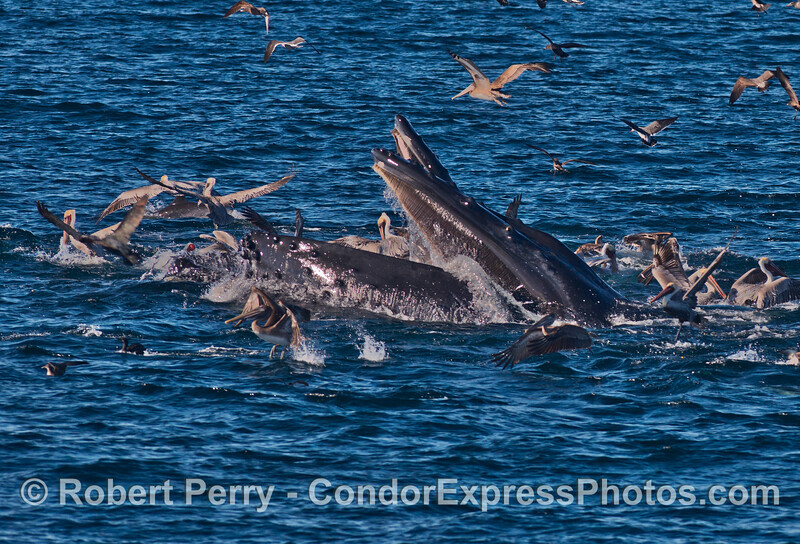 At least 300 common dolphins helped work the anchovy schools into a tight ball for consumption. 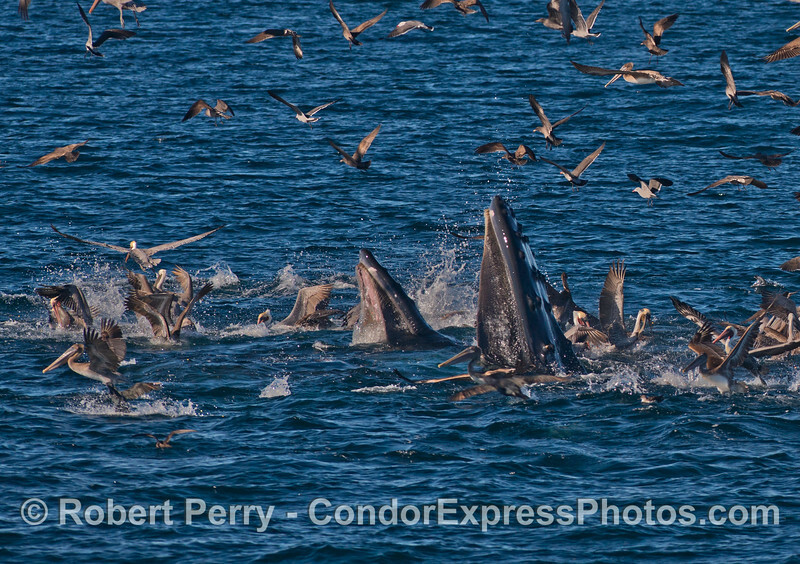 Three Minke whales slid by very close the to the Condor Express, feeding along the edges of this massive bait ball. It made dining table depictions of Henry the VIII look timid. On and on it went, fish jumping everywhere. Finally, as if by magic, the "switch" turned off and it was over. Probably not enough living anchovies left to make it worth while. The sea conditions were absolutely immaculate. Clear, sunny crisp and visibilities from San Miguel down to Boney Ridge with all 4 norther Channel Islands clearly visible. The water was also blue and clear down on the hot spot. 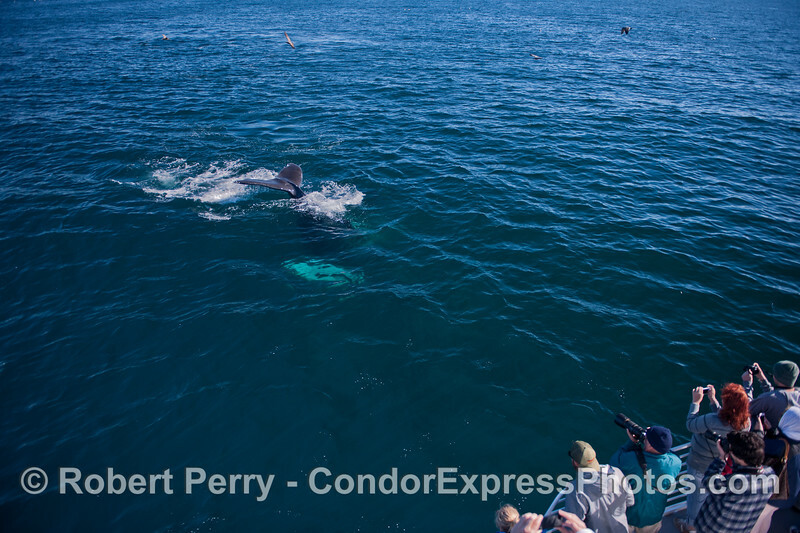 Just outside the Harbor we saw 2 inshore bottlenose dolphins, and outside on the way to the feeding grounds we encountered about 10 offshore bottlenose dolphins. 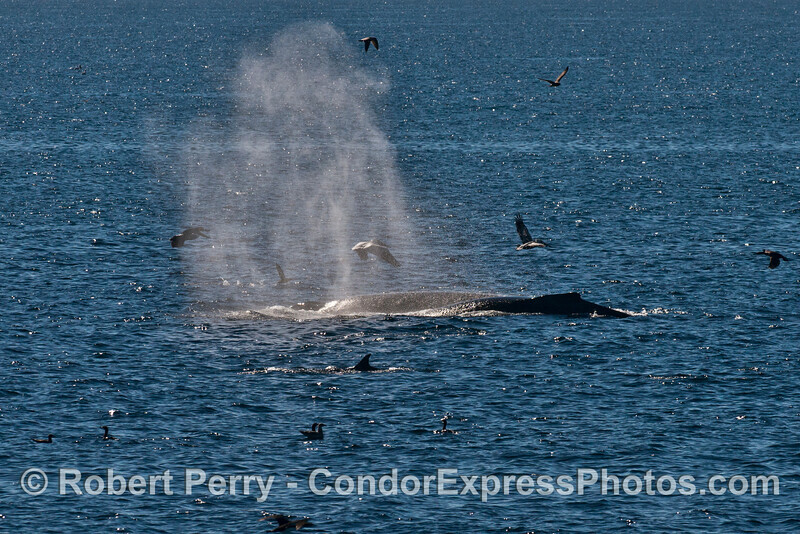 A great day for cetacean diversity AND abundance. 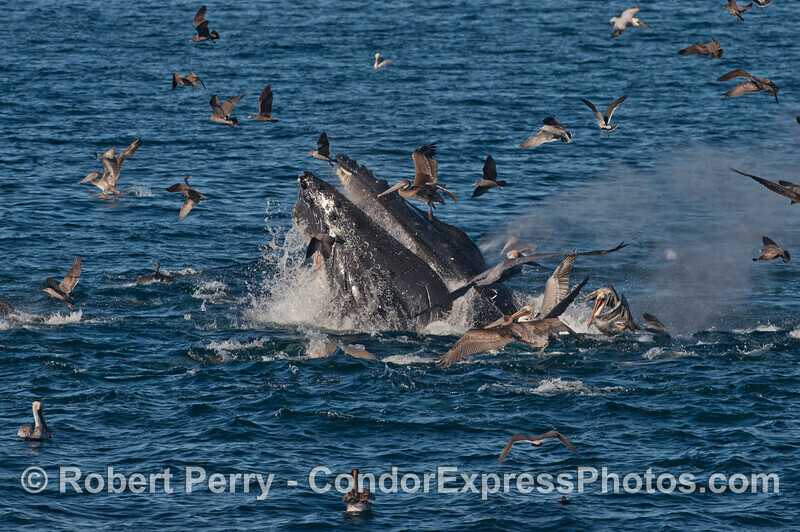 Look at these images in terms of the masses of pelicans and other seabirds working along side humpback whales on the hot spot. You can click the "Map This" button to see where we went. 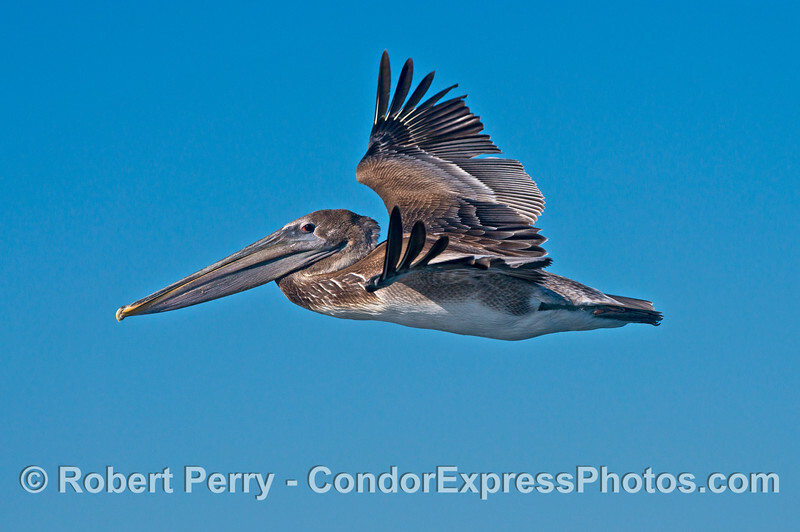 A long v-shaped squadron of brown pelicans (Pelecanus occidentalis) soared inches above the glassy ocean surface on an intercept course with the Condor Express. Half the squad made it past the bow, the trailing half had to fend for itself. 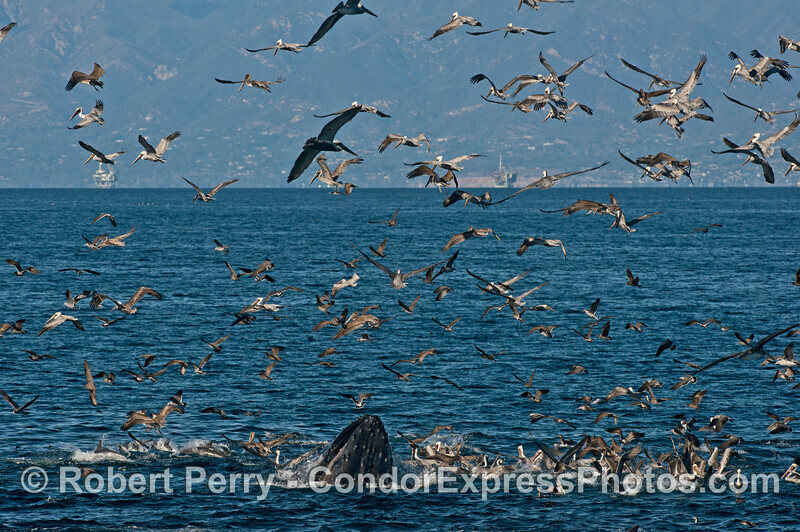 Most of the birds soared upwards, then over the boat. In the process, this young pelican came up eyeball-to-eyeball with my lens. Pelicans are fantastic beasts. 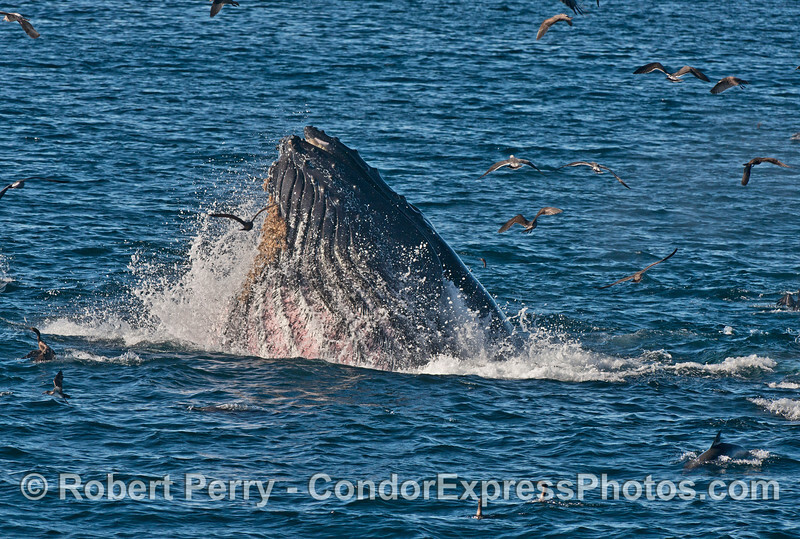 A humpback whale (Megaptera novaeangliae) lunge high out of the water with its ventral groove blubber expanded and full of fish. 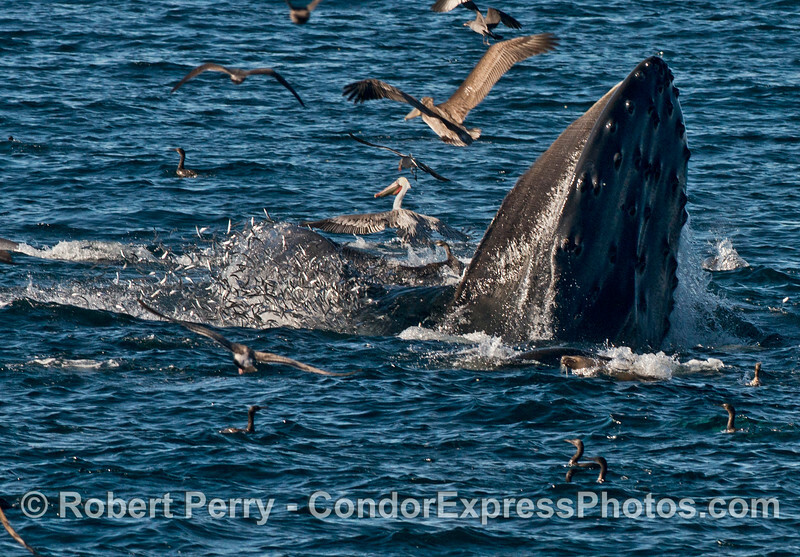 A humpback whale (Megaptera novaeangliae) tail masked by tons of sea birds. 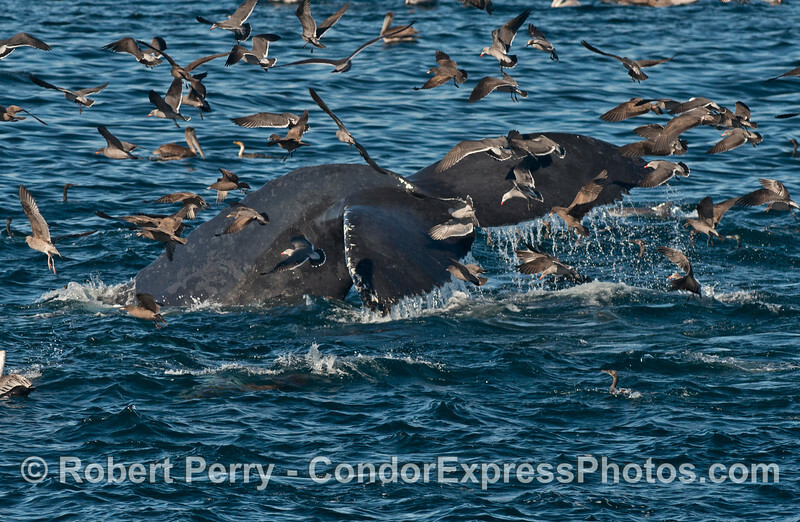 Two humpback whales (Megaptera novaeangliae) lunge feed on the surface attacking a massive school of northern anchovies (Engraulis mordax). In this rare glimpse inside the open mouth and inner edge of the baleen, you can see several anchovies entangled in the baleen fibers. 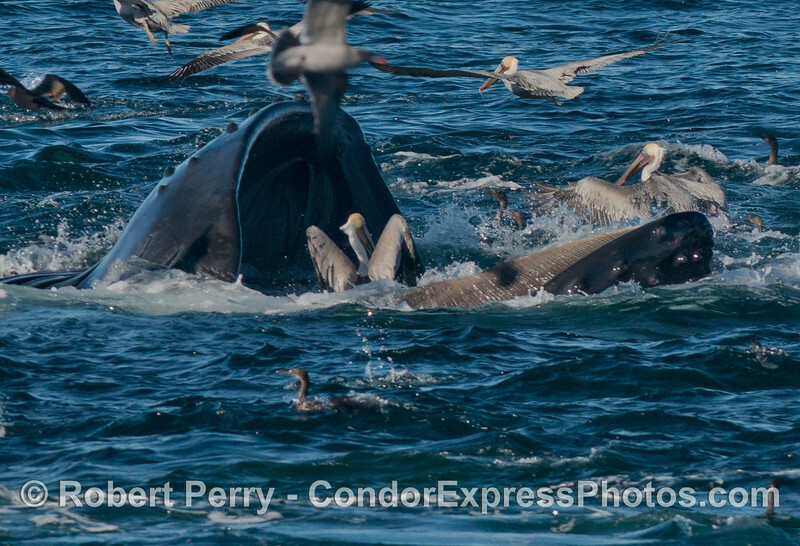 Image 1 of 2: A two shot sequence of a humpback whale (Megaptera novaeangliae) opening its massive jaws to let a brown pelican escape. 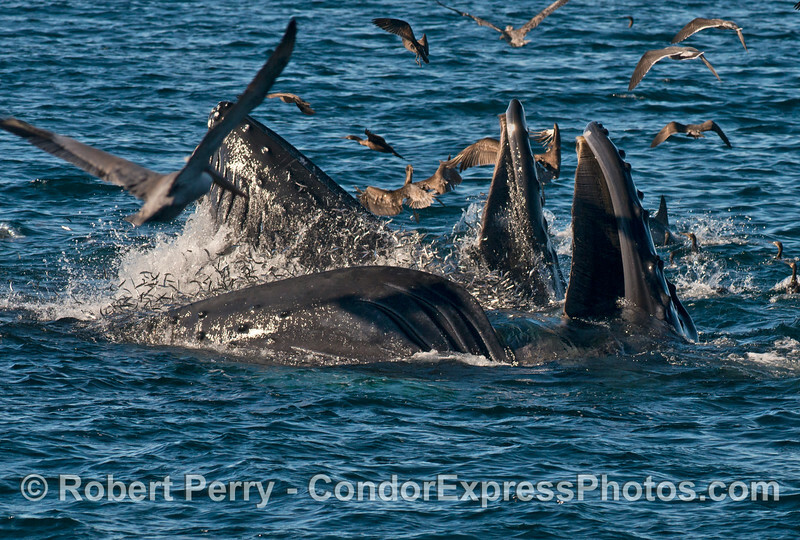 Image 2 of 2: A two shot sequence of a humpback whale (Megaptera novaeangliae) opening its massive jaws to let a brown pelican escape. 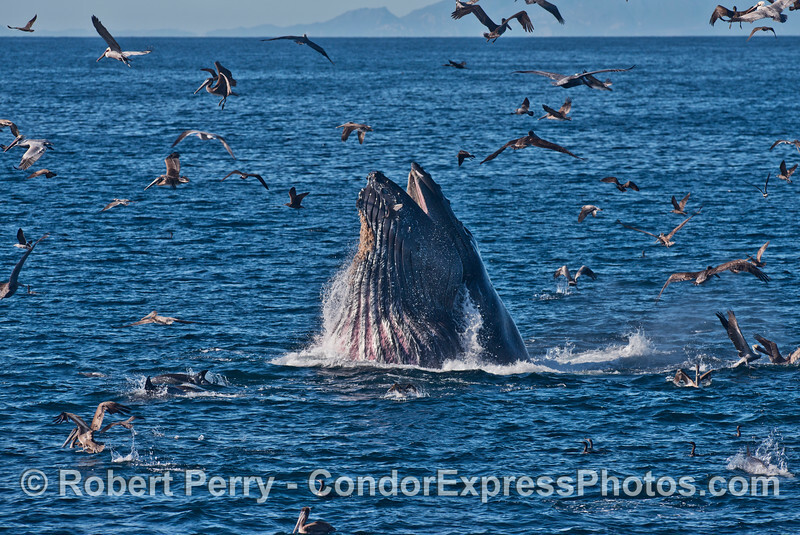 Hundreds of northern anchovies (Engraulis mordax) explode out of the water as they try to escape the giant jaws of \two humpback whales (Megaptera novaeangliae). 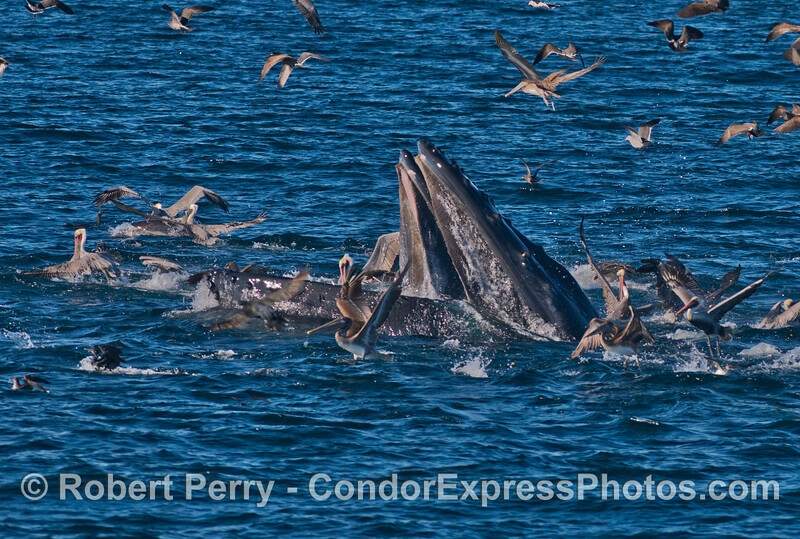 Fearless brown pelicans dive for anchovies left behind as a monster humpback whale (Megaptera novaeangliae) ejects water after gorging itself. 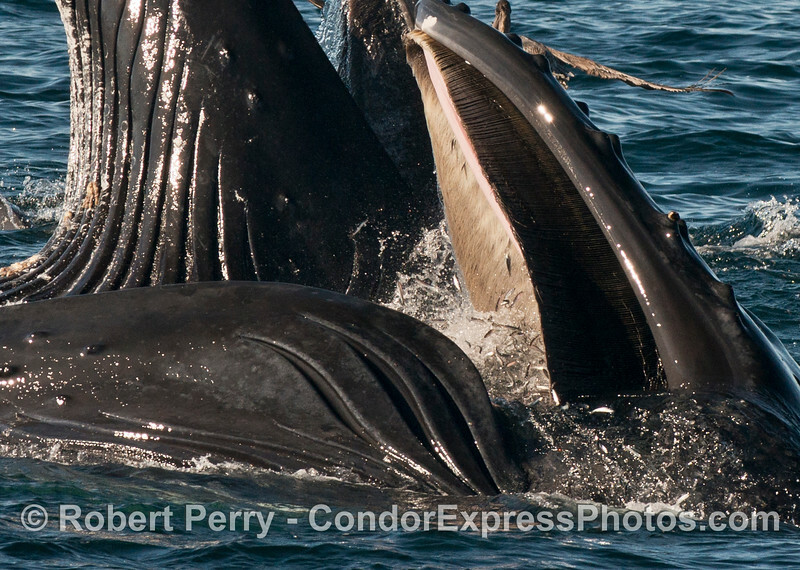 Long strands of dripping baleen are visible inside the mouth of this spouting humpback whale (Megaptera novaeangliae). 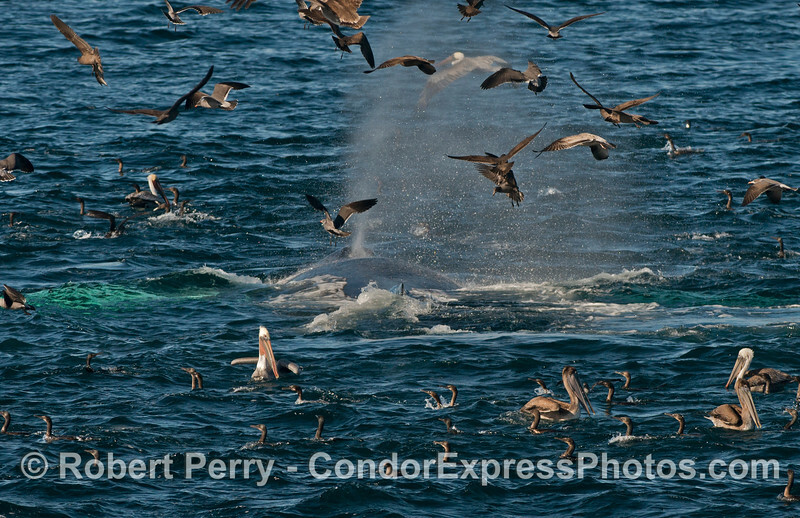 Two humpback whales (Megaptera novaeangliae) send up some spray as brown pelicans patrol the area. 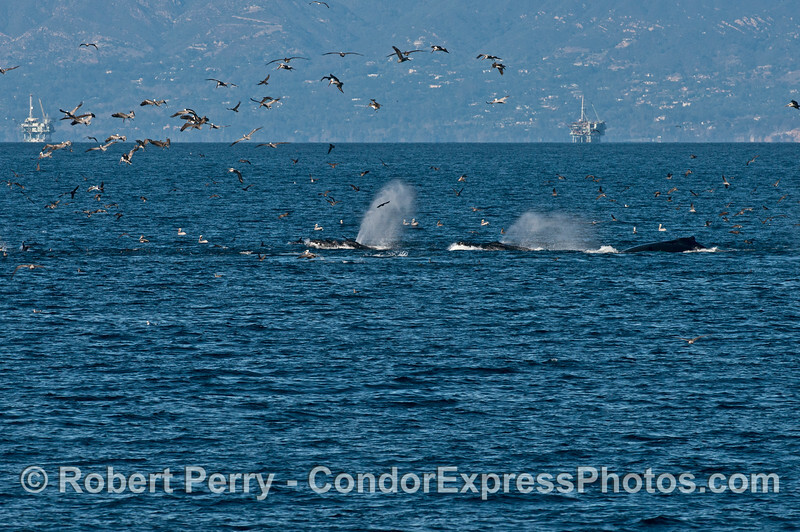 Three humpback whales (Megaptera novaeangliae) send up some spout spray into the brown pelican masses. 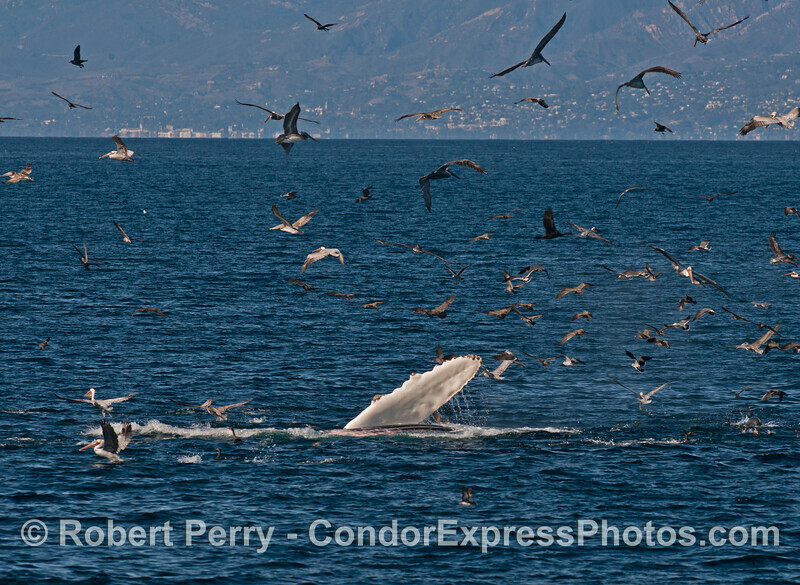 A humpback whale (Megaptera novaeangliae) with pure white pecoral fins takes a deep dive right next to the Condor Express. 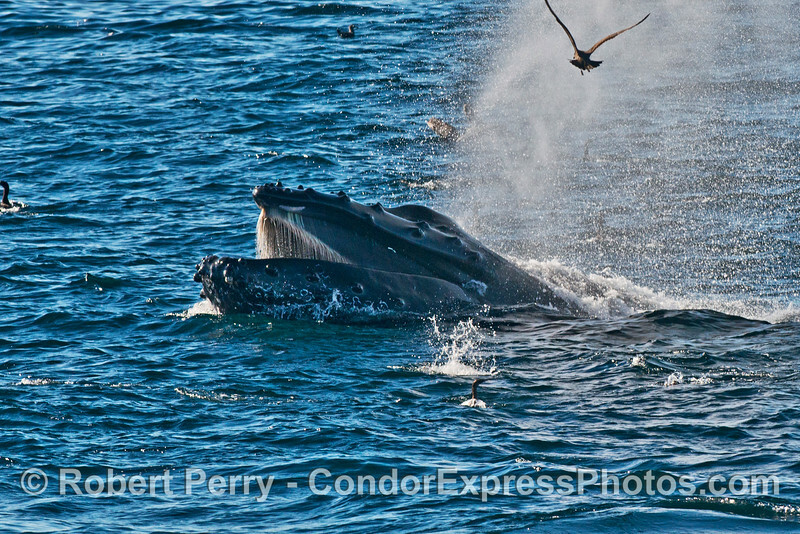 Here we see a bold humpback whale (Megaptera novaeangliae) surface right smack in front of the Condor Express bow. 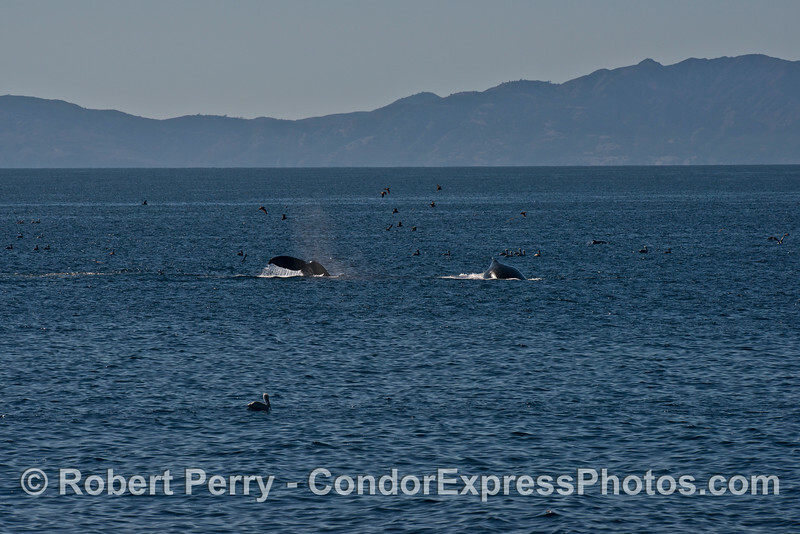 Two humpback whales (Megaptera novaeangliae) feeding with a few birds and Anacapa Island in the background. 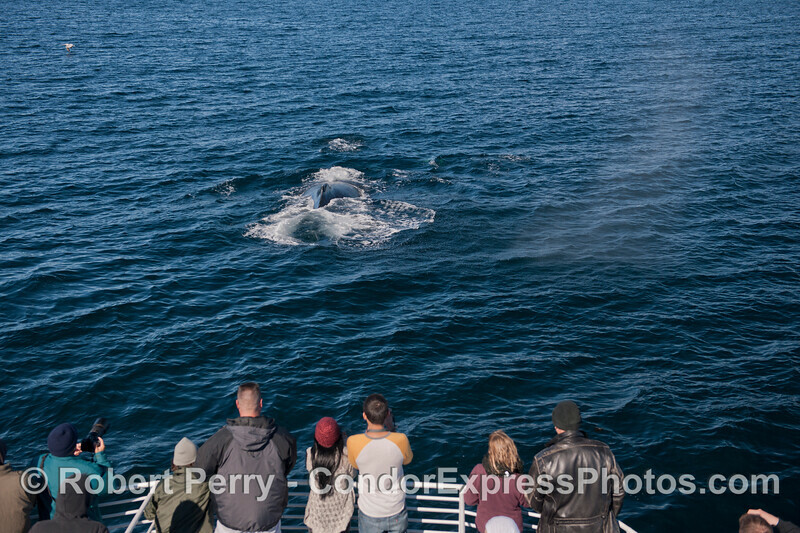 A balmy day with very light breezes causes the tall spout of this humpback whale (Megaptera novaeangliae) to hang in the air. 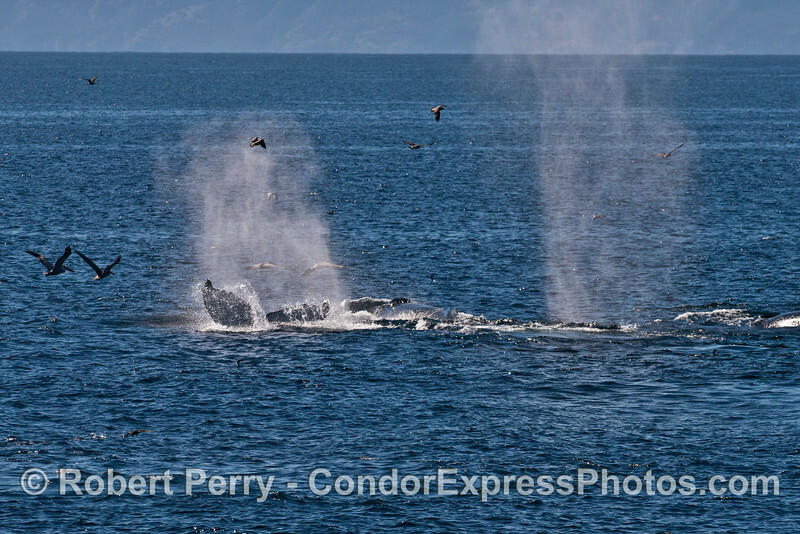 Multiple humpback whales (Megaptera novaeangliae) are seen feeding and spouting. A close look at a very friendly humpback whale (Megaptera novaeangliae) showing its knobby rostrum and tall splashguard. 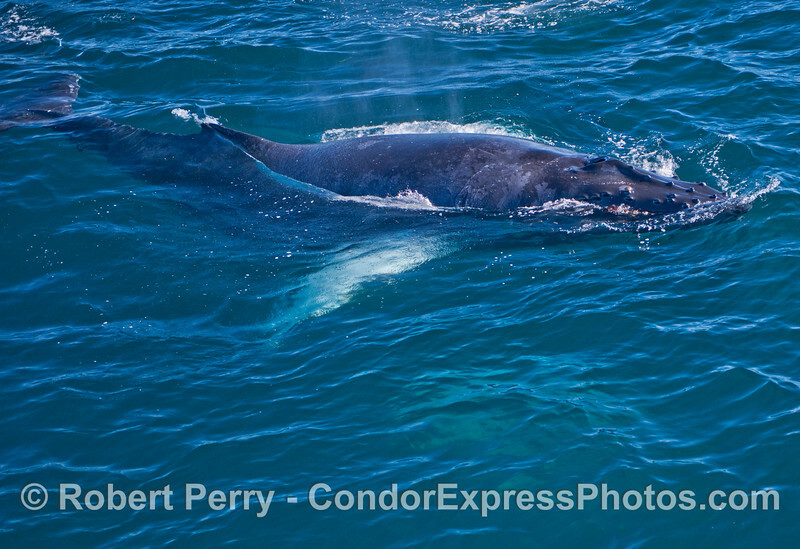 A feeding humpback whale (Megaptera novaeangliae) is depicted rolling over on its back and in the process exposing its long white pectoral flipper. 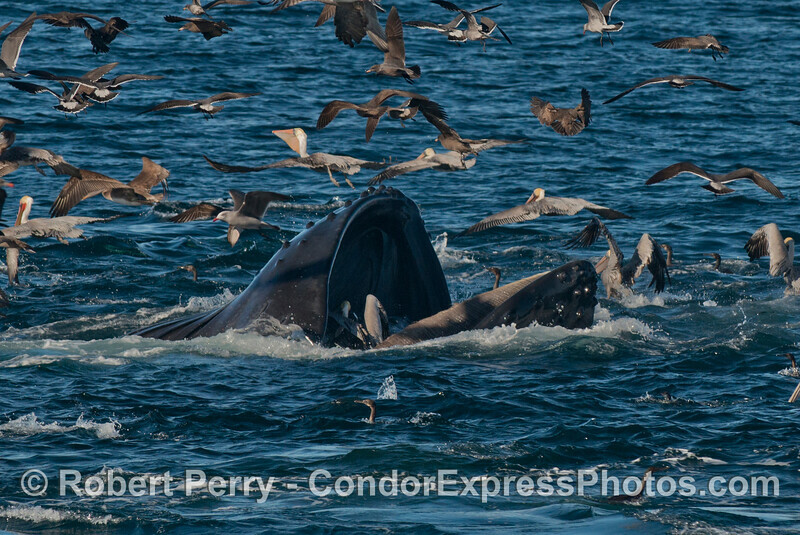 Hundreds of northern anchovies (Engraulis mordax) are seen spilling out of the giant jaws of a humpback whale (Megaptera novaeangliae) with plenty of seabirds picking up the scraps. 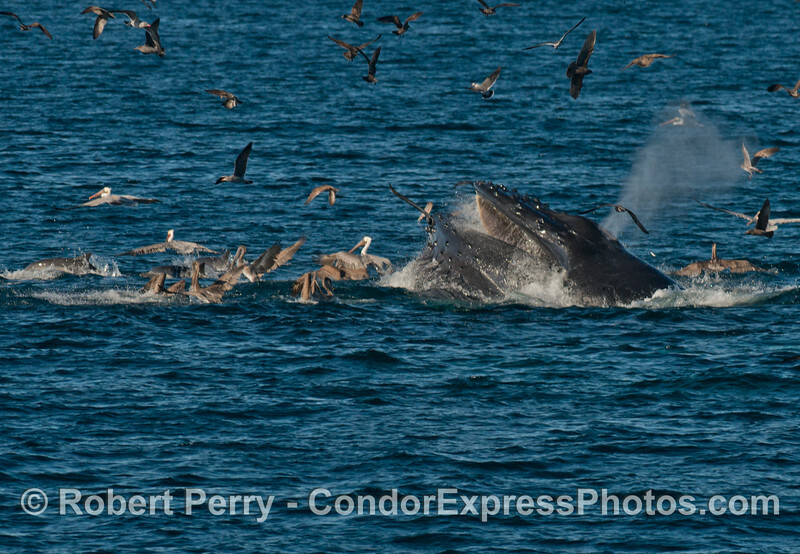 The sudden impact of two humpback whales (Megaptera novaeangliae) sends the brown pelicans and other seabirds flying. 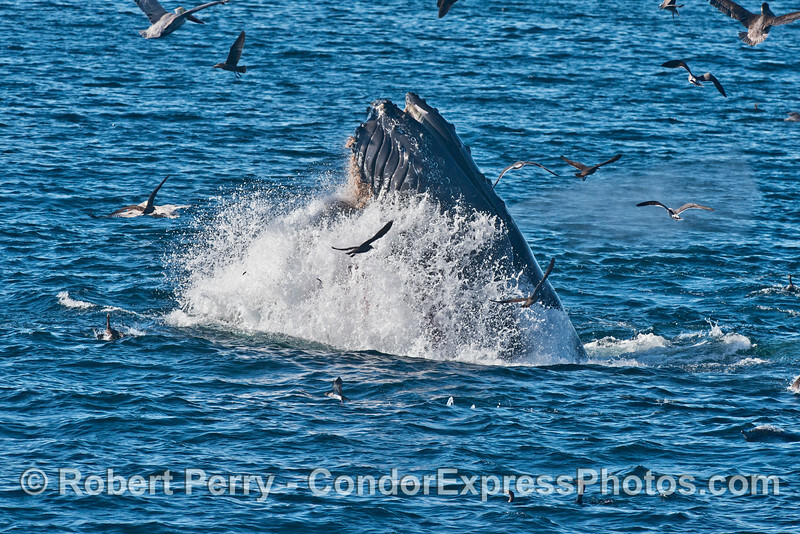 Two humpback whales (Megaptera novaeangliae) leave behind lots of small fish that don't get consumed. 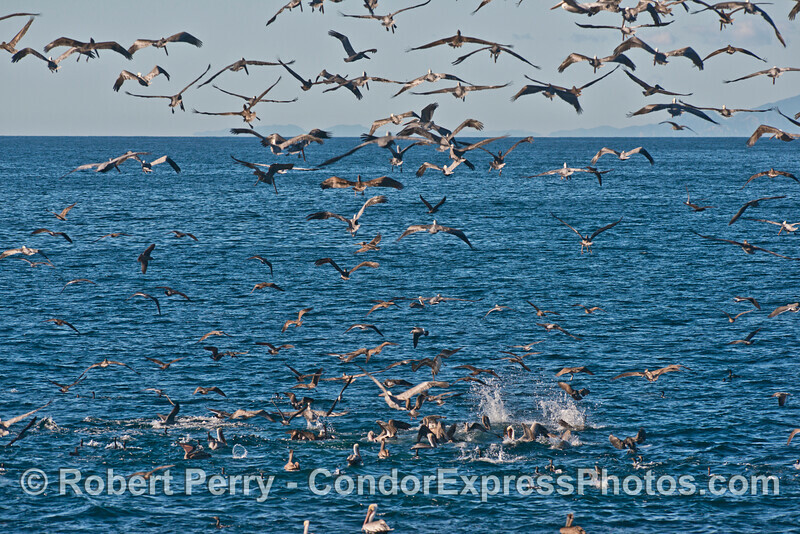 You know this, I know this and all the seabirds in southern California know this. 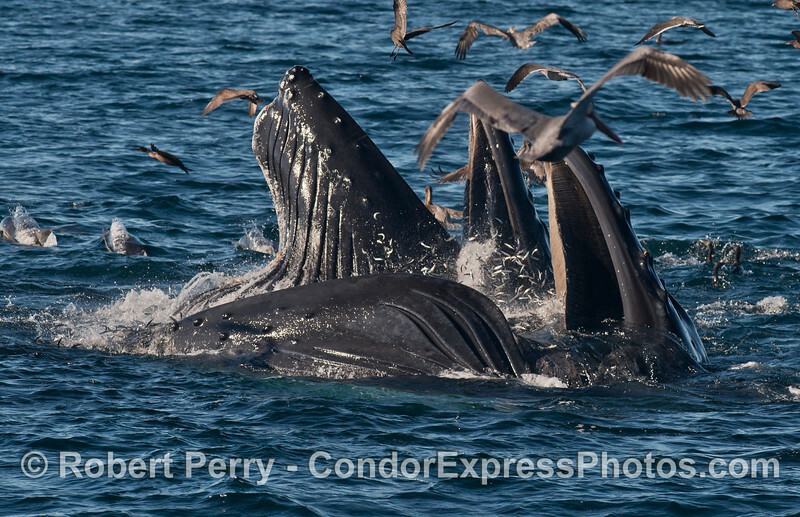 Surface lunge feeding by two humpback whales (Megaptera novaeangliae). 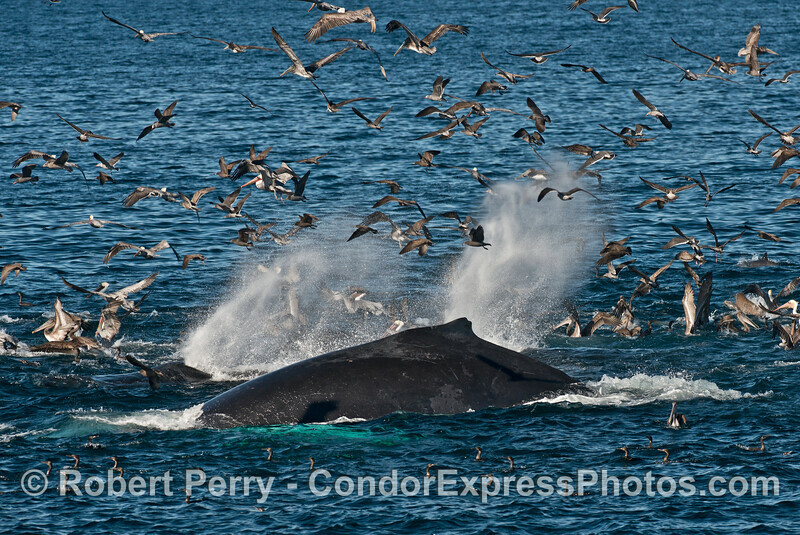 A fierce surface lunge feeding humpback whales (Megaptera novaeangliae) sends out a spout plume and motivates the seabirds. 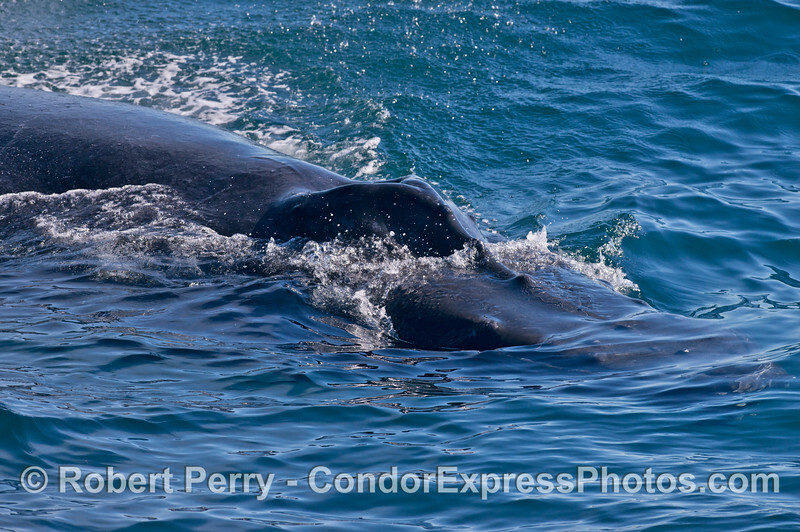 A humpback whale (Megaptera novaeangliae) is shown with its ventral groove blubber expanded and full of fish. 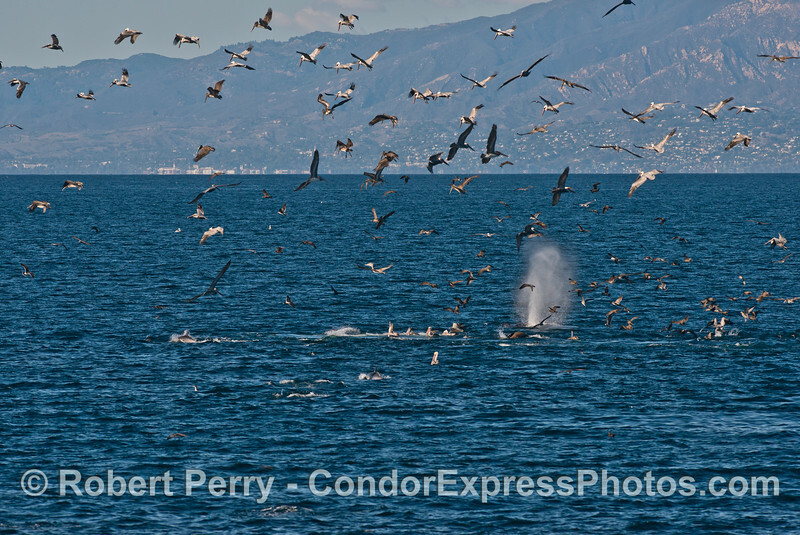 Seabirds and a humpback whale (Megaptera novaeangliae) - rounding out an oceanic hot spot. A humpback whale (Megaptera novaeangliae) tail. 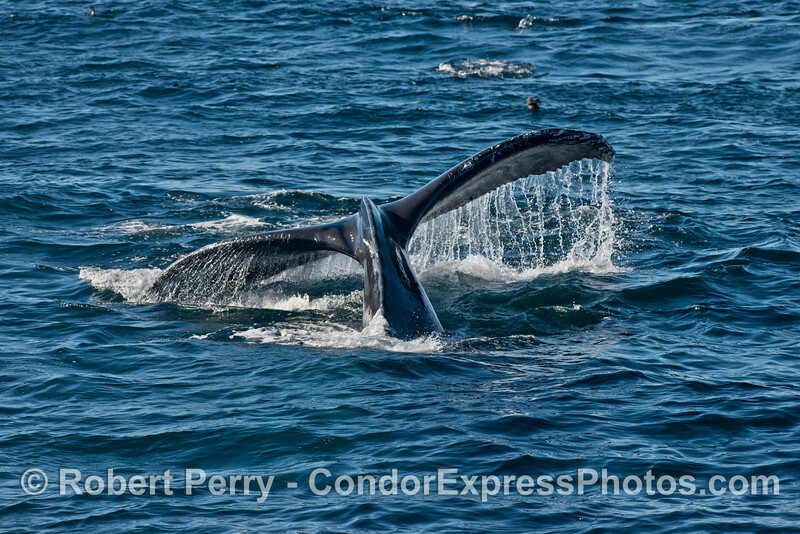 A humpback whale (Megaptera novaeangliae) - full body view with white pectoral fins. A brown pelican (Pelecanus occidentalis) HOT SPOT. 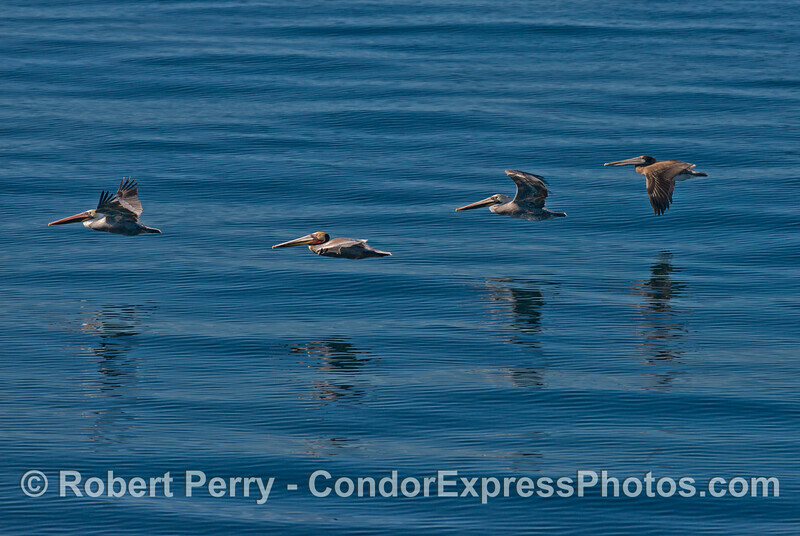 Four brown pelicans (Pelecanus occidentalis) in a line. 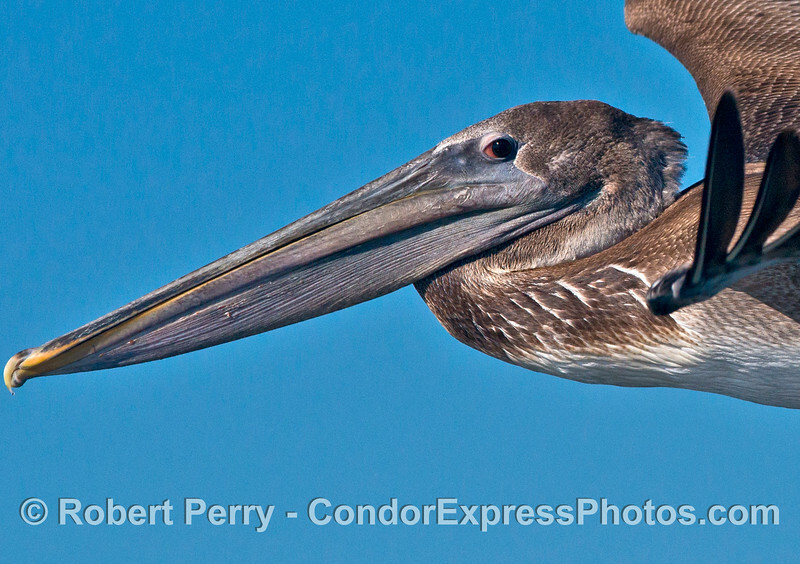 A young brown pelican (Pelecanus occidentalis) looks at the camera eye-to-eye. 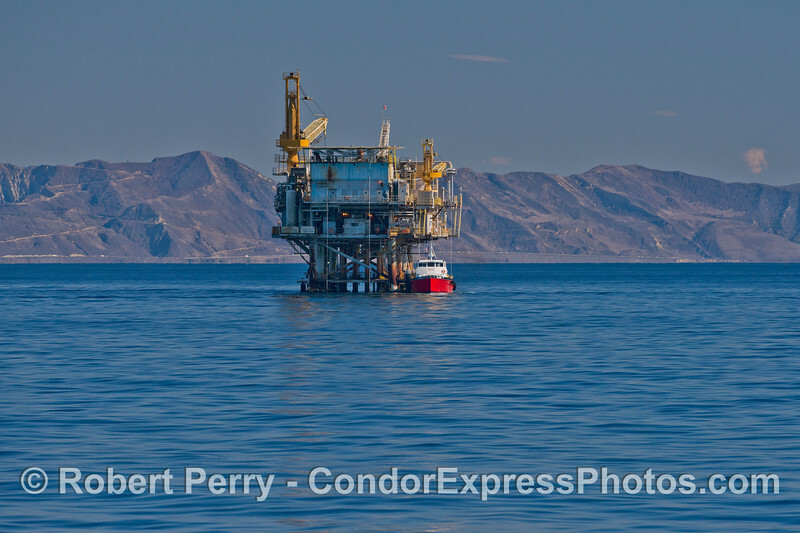 Platform Habitat & vessel Alan T.